Aval milk is the authentic drink of Malabar, Kerala. A rich, healthy, delicious drink that satisfies both hunger and taste buds. 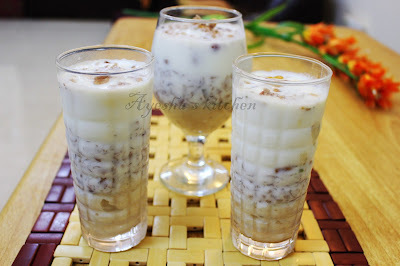 This preparation of Avil milk is very unique to the Malappuram district in Kerala and in fact, those people who have knowledge regarding this might say that this special drink evolved firstly at Kottakkal, Malappuram district, which is my native place. The main ingredients for this milk shake are roasted rice flakes / poha, Chiquita banana / Mysore banana (palayam kodan banana), roasted peanuts and nuts. So try this simple dessert come drink which is unique flavorful, rich, and healthy. It can be used as a breakfast smoothie or as a healthy dessert. Mash the bananas and sugar with a spoon or with hand. Do not blend in a blender. Mix well and set aside. Heat a pan with 1 tsp ghee and roast the rice flakes for few minutes or until crispy in a low flame. When done set aside. In the same pan, roast the nuts with some ghee and set aside. Now we are going to assemble it. So take two large cups. Divide the mashed banana into to equal parts and add it to each cups equally. Then add some roasted nuts and roasted peanuts over it equally to each cups. 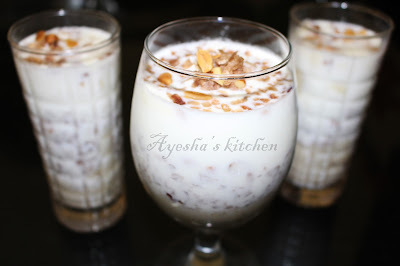 Now add the roasted rice flakes to each cups and finally pour milk over it. Garnish with a scoop of ice cream (optional), some rice flakes, nuts, and peanuts. If adding ice cream, you can reduce the amount of sugar used. You can watch my yet another aval milk shake recipe and paal pizhinjath recipe - VIDEO HERE .